Here is some practical advice courtesy of TreeSteward (and Woodworker) Jeff Lund on what to expect if you decide to have your yard tree converted into usable lumber after its demise. In general, trees are removed from yards for one of several reasons: 1) they have overgrown their original location and now present a falling hazard, 2) they are in the way of a planned project and are too large to move, 3) they were healthy trees that were unfortunately toppled by wind, rain, or lighting, and/or, 4) they have grown old and/or diseased and present a falling hazard. First, is the wood still good and would a sawmill want it? If your tree is healthy and the lumber appears to be sound without apparent damage, you can conclude that the wood is healthy and therefore desirable from a sawmilling point of view. In the case of old or diseased trees, the wood may or may not be desirable from a sawmilling point of view. Much of the desirable “figure” in cabinet lumber is a result of fungal infections of the wood. Thus, most of the yard trees that are available should be considered as desirable unless the fall or the disease has resulted in obviously extensive damage. Next, how large does a tree have to be to produce desirable lumber? The tree needs to be at least 16” in diameter and have a sufficient “bole” to produce good lumber. The “bole” refers to the portion of the tree above the ground where there is little or no branching. This non-branching bole, when sawmilled, results in straight-grained lumber that is desirable for projects both aesthetically and from an actual woodworking shop perspective. Typically, the lower, “bole” portion of urban trees is in the 8′ to 12′ range. Thus, if you have a 22″ diameter tree that doesn’t have significant branching for the first 10′, then you have a desirable tree. Next, what can different tree types be used for? Most urban trees tend to be deciduous, broad-leaved hardwoods like oak, cherry, and ash; so we’ll concentrate on them rather than the evergreen conifers such as pine and hemlock. The simple answer is that almost any deciduous hardwood tree without insect or structural damage would provide suitable lumber depending on what you had in mind to do with the lumber. For example, if you wished to convert your oak tree into a cabinet, then it should work fine. On the other hand, using your oak to produce cutting boards would not work; hard maple or sycamore would be a better choice for cutting boards. The best way to determine if your species is suitable for the use you have in mind is to consult a woodworking book or check the Virginia Tech Forestry website. Lastly, whom can I talk to or hire to do this work? 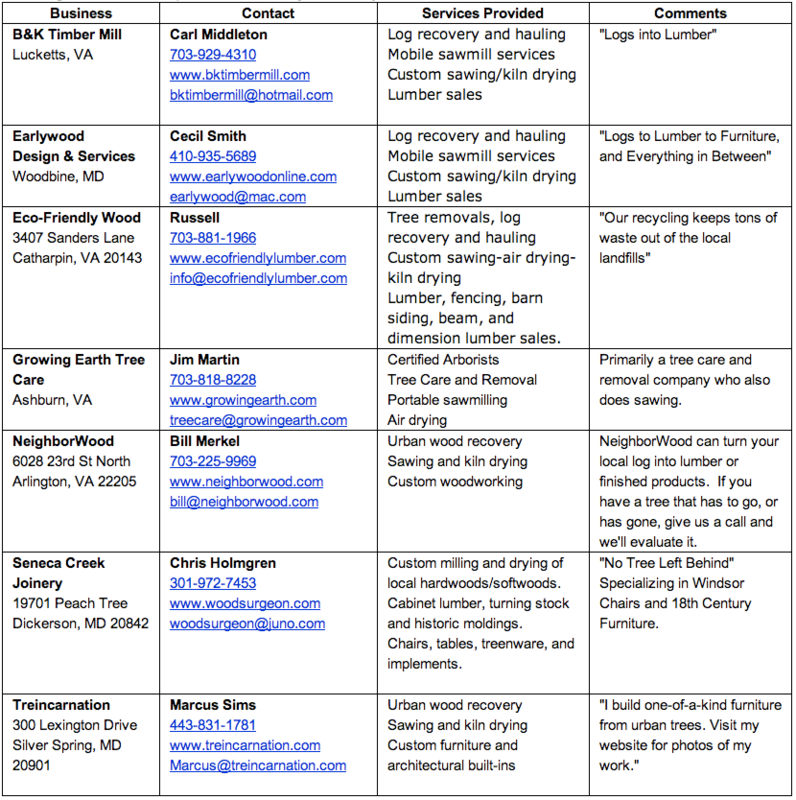 The following list should serve as a guide to who in the metropolitan area provides what services when it comes to converting urban trees into usable products. Check out the websites – they contain a lot of useful information. The list provides contact information for companies who can provide services such as log hauling, portable and non-portable sawmilling, air drying, and actual furniture construction. This entry was posted in Education, Tree Care and tagged recycling, woodworking. Bookmark the permalink.